I went to high school in Scotland where I completed Highers and Advanced Highers. Initially, I applied to study Music at various universities in Scotland but after attending interviews and finding out more about the courses, I decided to pursue this as a hobby and apply for a more academic course that I had developed an interest for through Clearing. I decided to study Criminology at City because of the central London location and its proximity to key criminal justice institutions such as the Central Criminal Court. The course is taught by leading researchers in the field and delves into various other subjects, including Psychology, Sociology and Politics. It is also part of the Q-Step Centre Programme, allowing you to specialise in quantitative methods. I love that I can choose many electives in different subject areas, meaning I will graduate with greater knowledge in various domains. I also love the friendly atmosphere and study environment at City, including various group study and social spaces. 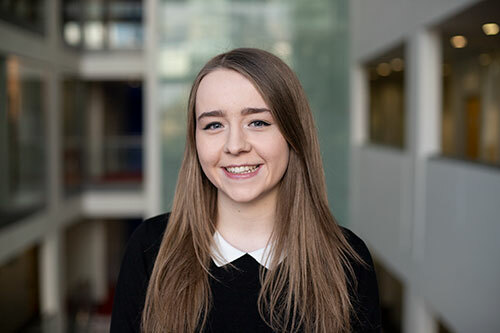 I am a Widening Participation Ambassador, Senior City Buddies Mentor and Leader, and Marketing Student Ambassador. I have also been a part of the Professional Mentoring Scheme which was a fantastic experience to develop a mentoring relationship with a professional and improve my career prospects. Last summer, I was also part of City’s Micro-Placement Programme, in which I completed a five-week placement at the Support after Suicide Partnership. I have also been a part of the City's Dance Society. I would like to complete a master's degree in Psychology. Throughout my time at City, I have taken many electives focused on Psychology that have sparked my interest for this subject and how it intertwines with Criminology. Grasp every opportunity available to develop yourself personally, professionally and academically.